Hironobu Yasuda and Joao Paulo Lima de Oliveira are the winners of the 300-km race at Fuji Speedway, the fourth round of the Japanese Super GT Series. The Japanese-Brazilian duo in the #12 Calsonic Impul Nissan GT-R finally reached the podium, after few misfortunes in the previous races. At Fuji Speedway, Yasuda and De Oliveira had a pretty calm race, starting from pole position and winning with 25.424sec gap over second-placed #17 Keihin Honda NSX of Koudai Tsukakoshi and Takashi Kogure. The #17 crew was fighting for P2 against #100 Raybrig Honda of Naoki Yamamoto and Takuya Izawa, making the decisive overtaking on Lap 51 of 66. In the last fifteen laps the #17 remained in the second place, while the #100 Honda was under attack of #1 Motul Autech Nissan GT-R of defending champions Tsugio Matsuda and Ronnie Quintarelli, but there was no more position changes. The decisive moment in a fight for the podium spots happened on Lap 36, when Katsumasa Chiyo went off the road in Turn 1 and hit the barrier with #46 Nissan GT-R. It was his first lap after taking the car from teammate Satoshi Motoyama, while they were in the second place. In the GT300 class, winner are Shinichi Takagi and Takashi Kobayashi in the #55 ARTA BMW M6. They started from pole and held off the #21 Hitotsuyama Audi R8 of Richard Lyons and Tomonobu Fujii by 0.106sec on the finish line. Takuto Iguchi and Hideki Yamauchi in the #61 Subaru BRZ finished third in class. After four races, Matsuda and Quintarelli remained in the championship lead. 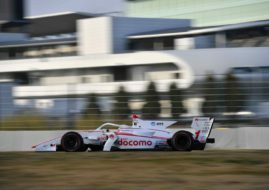 With fourth place at Fuji, they even increased the gap over Heikki Kovalainen and Kohei Hirate. James Rossiter and Ryo Hirakawa are third, while Fuji winners Yasuda and De Oliveira jumped to the fourth place. In the GT300 class, Fuji winners Takagi and Kobayashi progressed all the way from sixth place to the top of the championship standings. 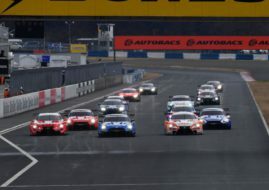 The next Super GT round is scheduled for August 27-28 at Suzuka Circuit.